Before you begin reading this article all about erik, let us first tell you that this is an updated article. Well, after a good few years of living in Turkey, our knowledge has improved a tad. This has been with the help of our own reading and research and also as a result of reader comments. Anyway, let’s talk about erik. Great name, isn’t it? Erik – Are They Really Unripe Plums? Erik – meaning ‘plum’ in Turkish – is one of those Turkish seasonal foods that really baffled us when we first moved out to Fethiye. We’ve mentioned in the past about çağla – unripe almond. 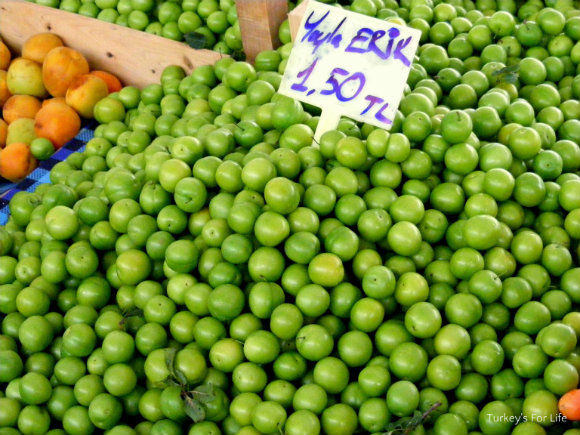 Erik is another example of the strange Turkish love of ‘unripe’ fruit. Why on earth would anyone want to eat unripe fruit? The British life education has been that this is going to cause your stomach no end of grief! Well, erik are the little green balls you can see in the photo and these ‘unripe plums’ are loved by the people of Turkey. 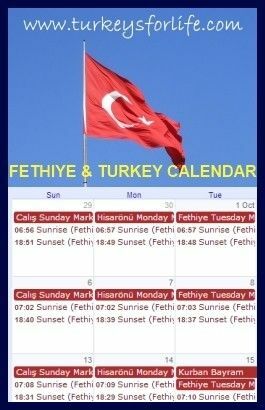 If you live in this part of Turkey, you’ll know that erik have been out for a few weeks. For us though, they are in their prime now. Well, as far as unripe fruit can reach its prime – which all seems a bit odd. But this is where a bit of more learned information comes in. Our Turkish friends always talk of ‘unripe plums’ and it’s not that they’re incorrect. It’s just their (understandable) translation. The erik are a shiny, vibrant green. Smooth and hard to the touch. They feel unripe. And, let us tell you, when you eat them early season, they taste unripe. Crunch your teeth into one and feel your face contort as if biting into a lemon. These particular erik are actually greengages. A member of the plum family but not unripe, at all. As the erik season progresses, the greengages will grown in size. Think ping pong ball. And they will cease to taste like unripe plums. They still have a crisp crunch and flavour but they sweeten a little; similar to the texture and flavour of a Granny Smith apple. If you can see the sign in the photo above, you’ll see that it says ‘tatlı.’ This means the greengages are now sweet. This is when we prefer to eat them. But no need to ignore greengages before they reach the tatlı stage. If there is one thing Turks are good at, it’s appreciating food in its simple form. They’ll buy the tart erik by the bagload and eat them as post dinner nibbles or as a snack. Bite into them and dip them into a bit of salt. The greengage is actually really pleasant eaten like this. A sip of rakı, wine or beer, lots of chatting, a sweet greengage, a dip of salt for the odd sour one. Eating greengages is a fun social activity. In May and June, Fethiye’s Tuesday market, the Çalış Sunday market and, of course other markets around the area have stalls brimmed with greengages. Buy yourself some and give them a go. As well as experiencing the flavour and texture of greengages, you will also be receiving their health benefits, too. Around the world where greengages grow, you will come across lots of ways of cooking with greengages. As we said above, though, Turks are great at appreciating food in its simple form. Mostly, you will see them being eaten as we described above. Having said that, there is also not much in the way of food that Turkish cooks won’t store in vinegar! We love our turşu (pickled goodies) in Turkey and erik turşusu is popular. You might also come across fried greengage (erik tavası) and, for the sweet fans, jam or compote is also made. Have you tried erik while in Turkey? Thumbs up or thumbs down for you? They’re too sour for me so early on in the season Sedat but I like them as they are now. Naz, it is strange isn’t it? When we go back to Britain for a visit, we find a lot of the food we used to love much too heavy. I came to this place by chance, but I found very interesting. Greetings to all the people who visit this page. I’d like to buy a tree of Erik green pruned, please tell me if it’s possible to find it on the web. We’ve never tried to buy erik on the web, Elvira, as they are so available on the markets, here. A Google search might reveal something for you. Good luck.